Sharing this post over at PINK PEPPERMINT DESIGN today! Have you visited her blog before? It is lovely. You must pop in for a visit HERE. Hello! I am Emily of Eleven Gables. 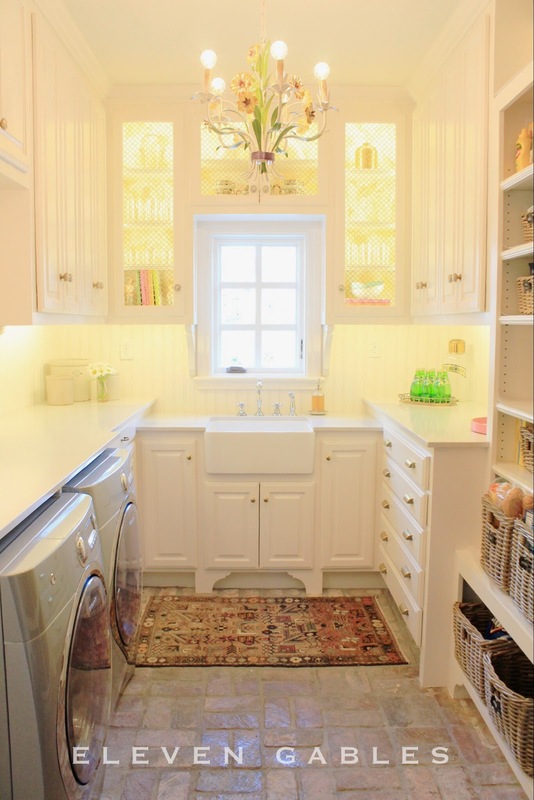 I am so thrilled to be sharing some of my Butler's Pantry/ Laundry room/ Wrapping and Craft room with the fabulous Pink Peppermint Design's readers! Thank you for allowing me into your home today. And Thank You, Tammy, for inviting me!!! Honestly, I am not an organized person by trait. I have to work at it. It does not come easy. I have a friend who has a rule "touch it once." Not me, I am like the kid on Family Circus that goes from one room to another and can't remember what I was doing in the first place. I digress... on to organizing! 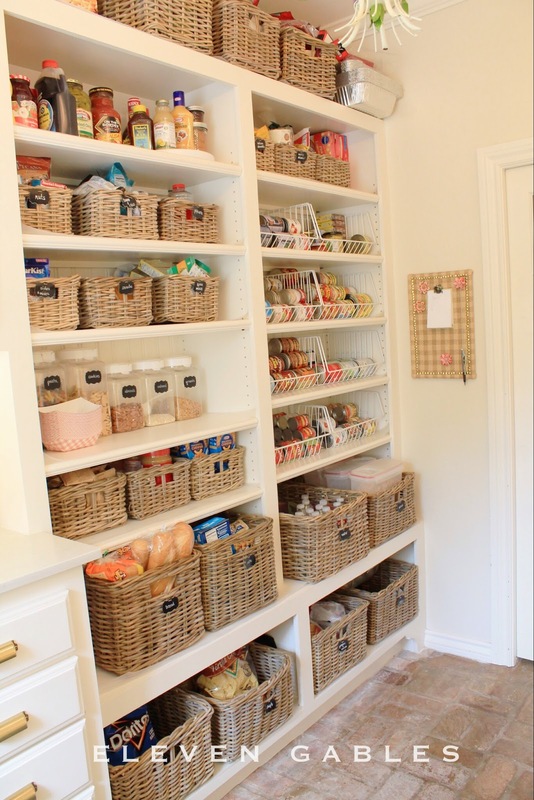 Organizing a Pantry can be pretty tricky. So many grocery items are awkward and bulky. We purchase in bulk at my home, so it was important to get my pantry area as organized (and pretty) as possible, then keep it that way. When planning our new pantry area, I had an "ah-ha" moment that square and rectangular storage was the most space effective, so I utilized my newfound knowledge to make the most out of a rather small space. 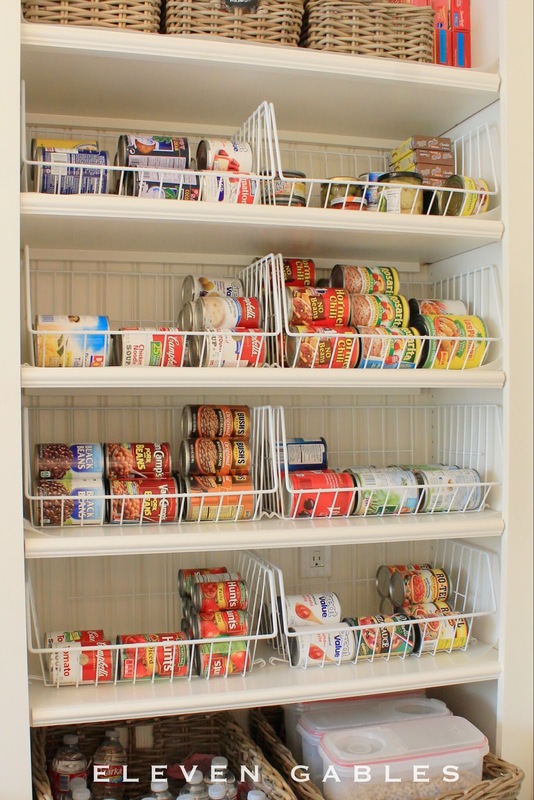 I used wire baskets to organize my canned food items. Adjustable shelving helped to add even more storage. 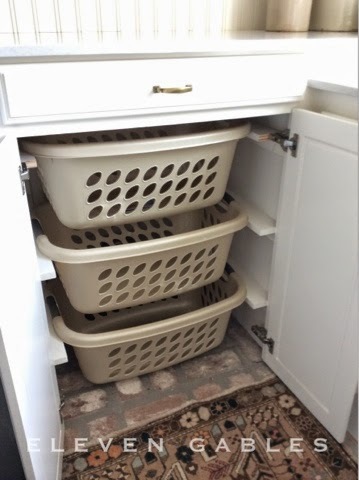 Larger baskets labeled with categories such as breakfast foods, chips, breads, and pasta keeps the bulky items tidy and easy to reach. Smaller baskets are labeled spices, nuts, sides, baking, etc. A top shelf is designated for the "extras"... things I use often enough to have a spare on hand. Groceries come straight from the car into the pantry. Even my five year old knows that everything has a place. Continuing the theme of "everything has a place," tension rods inside a drawer are magical! They keep ribbon and twine neatly in their place. could someone please tell that to my boys! To see even more of this space and all of my sources, go HERE. Happy New Year! Now, go organize something! I'm drooling over this space! How practical and pretty at the same time. Thanks for sharing! i LOVE that it has a wrapping station in it! that was a great idea! Emily, what a fabulous use of space!! 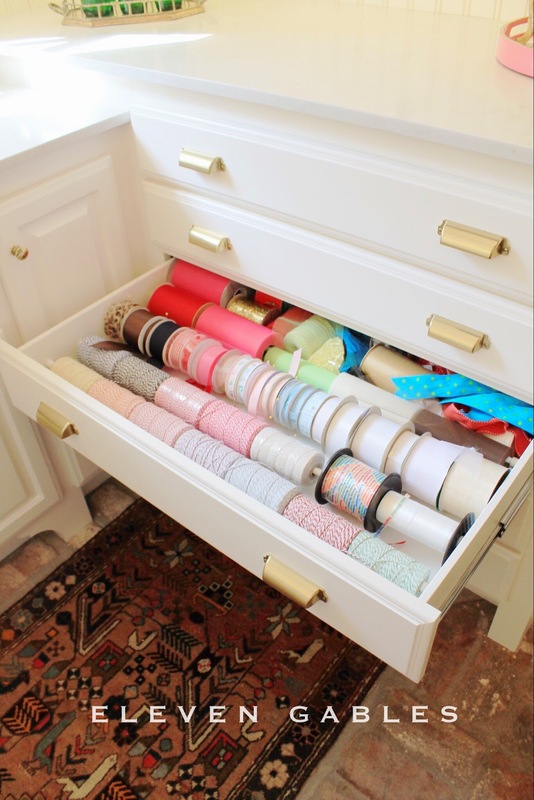 I love the organized ribbon - I have mine mounted on the wall of our mudroom but love the use of the drawer, so clever. 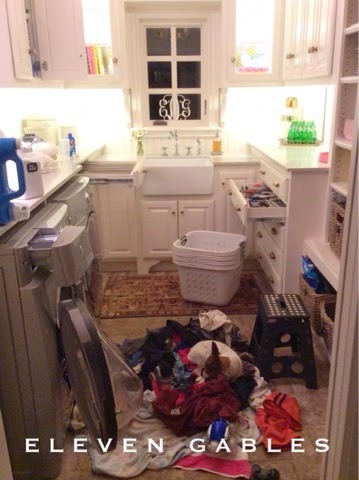 One of my to-dos this month is clean out my pantry and seeing your beautiful room is inspiring me to get going on that tedious project!! What a fabulous space! Gorgeous AND functional!! Love the wrapping paper station! I need one of those! I love the flooring . Is it brick? I am about to redo the floors in our house, do you like the brick and do you have it anywhere else? I would love to hear how you feel about it and if you would recommend it for a larger space. I am loving the drying rack! Do you by chance have a tutorial on that? Beautiful spaces you have. I am wondering the same! Love it!